I dare you to find a kid who went to church more than I did growing up. My parents strictly adhered to the philosophy that you should be in church every time the doors were open. Missing a church service, event or gathering was simply not an option. I can’t remember a time when I didn’t know about Jesus. But that doesn’t mean I was spiritual. In fact, I wasn’t. I said and did all the “right” things. I was “religious.” I believed in God. In fact, I was a Christian. I eventually tried again – to go to church. To be a good Christian girl. In my mid-twenties, I remember standing in church, singing the songs, going through the motions, but feeling empty. I prayed this prayer: God, I feel cold. If I’m going to keep doing this, you are going to have to make yourself real to me. He did. Through some incredibly painful experiences in my life, as well as the challenges of motherhood, He lovingly brought me from “head knowledge” about Him to a place of real, authentic, on-my-knees, I-need-You-every-moment relationship. Gradually, I began to believe that I didn’t have to measure up — I was loved no matter what I did or didn’t do. 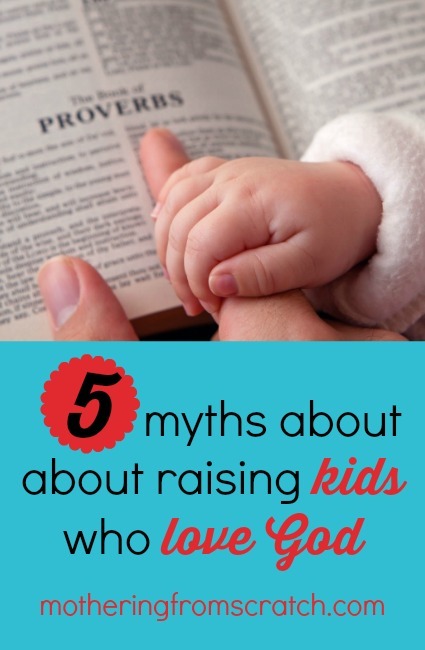 When I began raising my kids, despite my own personal experience, I had a rigid, naive, Pollyannaish view of how I was going to pass faith down to my children. Of what a Christian kid should look like. I was far too inflexible and passive. Myth #1: Kids who love God are always compliant and accepting. I have strong-willed children. My daughter, in particular, likes bucking the status quo. And that can be a very good quality. Neither of my kids take things at face value. Some of the talks I’ve had with my kids about faith, especially as they’ve gotten older, have been uncomfortable and messy. They ask hard questions. And guess what? That’s okay. They are asking. They are wrestling. They are learning from their mistakes (at least some of them!). I’ll take messy faith, over cold, dispassionate faith any day of the week. Myth #2: Kids who love God love Youth Group. I went to Youth Group. I never for one second thought my kids wouldn’t. We currently have a great youth group at our church and a phenomenal Youth Pastor. But for a variety of reasons, my kids have not connected. At first, I made both of them go. Teens and their reasons for not wanting to do certain things can be difficult for grownups to understand sometimes. Myth #3: Passive “nice” teaching of principles is enough to give a foundation in an evil world. It’s important to regularly expose the lies we see in the culture all around us. We live in an evil world. Safe, passive faith isn’t going to cut it. We have to be intentional and consistent in showing our kids how to live out their faith — why it’s practical, powerful and valuable in their everyday lives. Seeing us live out what we say we believe when it’s not easy and when it costs us something is powerful. Myth #4: Results are all up to the YOU. We can guide and teach our children. We can give them boundaries and give consequences. We can pray over them daily. But here’s the cold, hard truth: We can’t control our kids’ thoughts and choices. The older my kids get, the more true I find this to be. Only God can reach and mold their hearts. I have to trust Him to reach them in ways that I can’t. And, ultimately, they are responsible for their relationship with Him. Here’s the cold, hard truth: We can’t control our kids’ thoughts and choices. Myth #5: Rules are more important than relationship. I’m a rule follower. I always have been. Combine that with my tendency to be an image-concious people pleaser and you get a mom who focused more on the outward appearance than the heart. Yikes. I finally learned I had to also offer generous grace (not enabling!) and emphasize the reason behind God’s rules — His immense love for us. It makes all the difference. They also have to see our own vital relationship with Jesus. When they watch us turn to Him in good times and bad times, it shows them how to interact with a loving God who cares deeply about their heart. One of my most passionate prayers is that my children will love God more and follow Him. Thankfully, God promises to direct us as we raise our sweet children to draw close to Him. It just might look different than what we envisioned. great post! I have a strong willed daughter and we are having to learn and figure out how to show her the beauty of having a relationship with God through our daily relationship with Him vs just teaching her Bible stories and telling her about Christianity/religion. Good words. Love your authenticity. All true Melinda, I am learning and relearning on how to submit my desires for my children to God instead of trying to ‘make’ them happen. Ugochi recently posted..He Wants To Die.